Ancient Greek warriors became the premier warriors of their classical world. Through intense internal warfare, they perfected heavy infantry tactics, and when they were united, they were able to defeat an invasion by Persia, the super-power of their day. The heavily outnumbered Greek warriors, called hoplites, used superior tactics, training and arms to defeat two massive invasions. However, the Greeks returned to their incessant warfare once their common enemy was defeated. Philip of Hellenized Macedonia, king of what the Greeks considered a barbarian kingdom to their north, learned and even improved the Greek’s phalanx formation, and eventually dominated Greece. His son, Alexander the Great, then took the Macedonian and Greek warriors he inherited from his father and conquered the known world. Greek culture, called Hellenistic, became dominate from Sicily to India. A Greek hoplite warrior. Well armed and armored, they were the premier warrior of their day, frequently defeating enemies even when heavily outnumbered. During the Bronze Age, starting around 1600BC, the ancient Greeks fought in the heroic style of Homer. Each warrior fought for personal glory instead of in an organized formation. Battles usually started with taunts and jeers, followed by duels between champions. If neither side lost its nerve, a general battle would begin. Ancient Greek warriors had already started to wear cumbersome, but effective, armor, and casualties were usually light during the melee. Men fought armed primarily with spears and short swords, and the Greek warriors had already jumped ahead of their contemporaries in the use of shields and armor. They considered ranged weapons, like the bow, to be cowardly and avoided them. Much like in later phalanx warfare, the real carnage started when one side was routed. Fleeing enemies could not make use of their shields and made excellent targets. Warrior kings like the semi-legendary Agamemnon ruled from massive stone hill-top fortresses, raiding and making war for profit and glory. Eventually during 12th century BC, for reasons not completely understood, Greece entered into a dark age of slow decline. Written language was lost, and the great palaces and cities were destroyed or abandoned. A dark age settled across much of the eastern Mediterranean and Middle East at the same time, and there are many theories as to why. Regional droughts, changes in warfare and natural disasters have all been blamed. It was most likely several converging factors, but we don’t truly know at this time. Starting around 800 BC, Greece began to recover. Over the next 400 years, the Greeks developed democracy, theater, poetry and philosophy, as well as rediscovered written language. Some time before 650 BC, they developed the phalanx, and their warriors and warfare itself began to change as well. Warfare in Greece had always been dictated by the terrain; the rough ground was unsuitable for chariots. In earlier times when their contemporaries developed chariot warfare, Greek warriors concentrated on heavy infantry. Besides Thessaly, the Greeks also neglected the development of cavalry in their military. However, their concentration on heavy infantry would pay off in the power of their hoplite warriors and phalanx formation. Ancient Greek warriors were citizen soldiers, except for the professional army of Sparta, and warfare became somewhat standardized to allow for soldier-farmers to tend to their farms. Only after the harvest had been brought in from the fields would the Greeks take up arms. The different Greek city-states would then settle their many issues during the campaigning season. Warriors would settle scores on pre-selected battle fields, usually a plain between the two warring city-states. The warriors would form up into the famed phalanx on opposite sides of the mountain-surrounded plain. The Greek warriors were called hoplites, named after their shield, the hoplon. Hoplons were heavy, bronze-covered wooden shields about 3 to 3.5 feet in diameter. It spanned from chin to knee and was very heavy (17- 33 pounds). These shields had a revolutionary design; their rounded shape allowed them to be rested on the shoulder for additional support. They also featured a new grip and forearm straps that gave them great amounts of mobility and allowed them to be used offensively to bash opponents. The Greek warriors overlapped their shields, forming a shield wall. The left part of each warrior’s shield protected the right side of the hoplite to his left. A phalanx would consist of rows of spear-armed hoplites, all protecting each other and presenting a wall of shields and spear points towards their enemies. The first two rows of a phalanx were able to stab at opponents with their spears that protruded from between the shields. The first three rows, or ranks, of a phalanx could stab their opponents, while the back ranks would brace the front rows, prevent the front rows from retreating and support the all-important cohesion of the formation. Phalanxes could be 4, 8, 16 or more men deep, up to 50 rows in some extraordinary instances. This made the back rows relatively safe, giving them little reason to flee a battle, while the front rows were pressed between their own forces and an enemy bent on killing them. Yet, to the honor-driven Greek warriors, the front was where they wanted to be! In their martial culture, warriors sought glory in battle, and a general placed his best men in the front ranks. Greek warriors were required to arm and armor themselves. Hoplite armor was extremely expensive and would be passed down through families. The amount of armor a Greek warrior wore varied. Peasant hoplites may have only carried a shield and maybe a helmet or secondary weapon, while battle-hardened Spartan veterans would have been armored from head to toe. The rich upper-class hoplites typically had the “works.” They wore bronze breastplate fashioned in the bell or muscled style, a bronze helmet that protected their face, and greaves for shin protection. The bronze breast plates alone could weigh an astounding 50-60 pounds! A slightly less well-off hoplite may have linothorax armor, made from stitched and laminated linen fabrics that were sometimes reinforced with bronze scales and/or animal skins. Linothorax armor was the most common type, offering decent protection at a moderate price. Helmet designs varied over time and offered varying amounts of protection. Innovations including cheek plates and visors were added for additional protection. Each city state had its one design on the crest of their helmets. 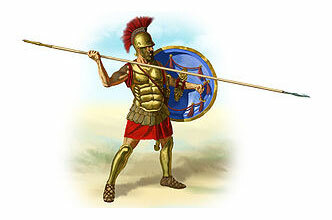 Hoplites were armed with long spears, called doru. Doru were that were around 7 – 9 feet in length, although this varied. Greek warriors carried their spears in their right hands and their shields strapped to their left. Greek warriors probably employed both underhand and overhand grips, depending on the situation and amount of leverage required. Holding the spear underarm may have been optimal for the front line of the phallanxs while Hoplites in the second and third ranks would almost certainly have made overarm thrusts. The rear rows held their spears in an underarm grip, and raising them upwards on an angle to provide an extra defense against incoming missiles. Doru often had curved leaf shaped spearheads and had a spiked point, called a sauroter, at the opposite end. The spear could be spun around if something happened to the spearhead in battle, but it was more commonly used to stand the spear up by planting it into the ground. This practice gave the sauroter its name, sauroter is Greek for “lizard killer”. It was also used by the back ranks to dispatch fallen enemies as the phalanx advanced over them when they held their spears in the upright position. The sauroter also served as a counter weight, balancing out the spear. Not every Greek warrior was a hoplite, and though often neglected, Greek armies were usually accompanied by other troop types. Light infantry and cavalry troops were used as skirmishers and to protect the vulnerable flanks of the ponderous phalanxes. Javelin throwers called peltasts would be used as skirmishers, harassing enemy formations and masking troop movements behind them. They were armed with several javelins. Peltast warfare was developed in Thrace while the Greeks were developing an heavy infantry almost exclusively. This led to many of the light infantry being mercenary troops, hired from outlying regions of Greece. For instance, the Agrianes from Thrace were well-renowned peltasts, whilst Crete was famous for its archers and the Beleric Islands and Rhodes were famous for their slingers. During and after the Peloponnesian War use of light infantry became more common. This was dui to the Battle of Lechaeum (391 BC) when an army of Peltasts defeated an army of hoplites for the first time. Astonishingly a force of 600 Spartan hoplites was defeated using hit and run peltast tactics. Of the Greek City states, only Thebes developed their cavalry, a development noted by Phillip of Macedonia and Alexander the Great. Theban cavalry would be the model for the Macedonian Companion cavalry and eventual serve beside them under Alexander. From its dawn around 700-650 BC, hoplite and phalanx tactics dominated warfare. Phalanxes triumphed over disorganized enemy hordes and quickly spread through Greece and beyond. The Greeks perfected hoplite tactics though endemic warfare. Hoplite tactics hit their high water mark when smaller Greek armies defeated two massive Persian invasions (499-448 BC). Hoplite formations decimated the lightly armored Persian infantry in famous battles like Marathon (490 BC) and Thermopylae (480 BC). However, the Greeks never capitalized on their victory over the world’s super power. Having defended Greece from foreign control the Greeks went back to their insistent warfare against each other. They then launched themselves into another series of wars. First the leading Greek cities of Sparta and Athens warred for supremacy in a decade’s long war, dragging most of the other Greek cities into the conflict (Peloponnesian War 431 BC - 404 BC). Only ten years later the Spartan hegemony was challenged in the Corinthian War (395-387 BC). Sensing the Spartan weakness, an alliance of Athens, Thebes, Corinth and Argos, supported by their enemy the Persians, sought to escape from the hegemony, and increase their own power. This was fought to a stalemate, but Thebes then led yet another war against Sparta. At the decisive Battle of Leuctra (371 BC), the Thebans routed the Spartans and their Allies. The battle is famous for the tactical innovations of the Theban general Epaminondas. Defying convention, he strengthened the left flank of the phalanx to an unheard of depth of 50 ranks, at the expense of the centre and the right. The centre and right were staggered backwards from the left flank and away from the enemies. This 'echelon' formation allowed the phalanx to advance obliquely. The Theban left wing was thus able to crush the elite Spartan forces on the allied right, while the Theban centre and left trailed behind and avoided engagement. After the defeat of the elite Spartans and the death of the Spartan king, the rest of the Allied army retreated. This is one of the first known examples of both the tactic of local concentration of force, and the tactic of 'refusing a flank'. The Spartans and their allies were again defeated by the Thracians and Epaminondas in the largest battle ever fought between the Greeks at the battle of Mantinea (362 BC). Spartan hegemony had been broken, but the Thebes had lost many warriors, including their ingenious general, Epaminondas. Unfortunately for the Greeks the Macedonian King, Phillip, had taken note of the tactics Thebes had used and even improved on them. Philip doubled the length of the spear used by his phalanxes and reduced the shields his warriors used, allowing them to hold their spears with two hands. He also understood that while a phalanx is almost unstoppable from the front they are vulnerable from the flanks and rear. Phillip wisely used combined arms tactics, incorporating cavalry and light infantry to protect his phalanx. His phalanxes would then pin down opponents forces while his mobile forces outflanked them. When Philip attacked Greece (356-338 BC) the divided and exhausted Greeks could not stop him. Phillips son, Alexander the Great, then took the Greeks, their way of warfare and Hellenistic culture on a world tour of conquest. Persian, Egyptian and even Indian armies were defeated but the Greeks had forever lost their position as the world's top warriors. However, with Alexander and his sucessors Greek culture, civilization and ideas were spread across the known world.